Cleaning your vehicle is not only a chore, but it can be a risky business. Have you ever thought what are those strange smudges on your vehicle, even though you just went through the drive-through car wash hours before? Oh, the cruel irony… you go with the intention of cleaning your car and end up leaving with blemishes, like swirl marks, littering your paintwork. It’s not the most ideal scenario. However, there are ways to avoid this happening, by better understanding what causes these marks and how you can be more careful when cleaning your car.Swirl marks are caused by using the wrong type of polishing pads and the swirls, therefore, are microscopic scratches or abrasions on your vehicle’s paint finish, caused by grit and dirt from your sponge or rag, being rubbed over the paint. This is what leaves the distinctive pattern of tiny scratches. Help! How do I avoid this kind of paint damage? Avoid using a drive-through car wash, as they often use abrasive polishing pads that can damage your vehicle’s coating. Avoid using pads that have not been stored properly or have fallen on the ground, as these are not washed, and it can cause swirl marks on your vehicle.To avoid swirls, completely wash any dirt particles on the surface of the vehicle before applying your polish or wax. Only use a microfibre towel or mitt which as itis good quality and it will lift and absorb the contaminants and grit from the surface of your vehicle. Whereas normal cloths would not be as effective in cleaning, as they would just smear the grime all over the surface instead of removing it, thus creating swirls and scratches on the paintwork. 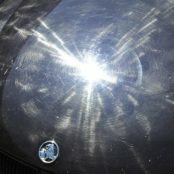 What is the best way to keep my vehicle’s paintwork scratch free? The best way to stop dirt and grit from sticking to your vehicle is by using a wax or sealant to protect your paints finish. This extra layer will act as a protective coating over your paintwork and it will also ensure that your paintwork remains shiny and smooth, thus reducing the chances of dirt sticking. Step 1: Fill the first bucket with your preferred car shampoo. Step 2: Fill the second bucket with plain, clean water. Step 3: Soak your microfibre mitt in the car shampoo and start to clean your car. 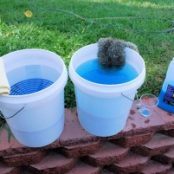 Step 4: Do not put your microfibre mitt back into your first bucket without submerging it into bucket number two for a good rinse. This way, all the grit that has been absorbed doesn’t contaminate the car shampoo. Essentially, the dirtier your vehicle, the more you should ensure that your microfibre mitt is clean. Step 5: When done, rinse the vehicle with clean water (don’t throw the dirty water from the second bucket over the vehicle). Step 6: With a chamois or another clean microfibre towel, you can begin drying your vehicle. Squeeze out the water in between wipes. With this washing procedure and use of non-abrasive cleaning materials, you will definitely avoid damaging the surface of your vehicle. If ever you notice those dreaded swirl marks on your paintwork and you want it fixed in no time, book your vehicle with Bodyteq today! Bodyteq is the go-to for auto paintwork problems. ← Car Insurance Excess & How To Legally Avoid Paying It!